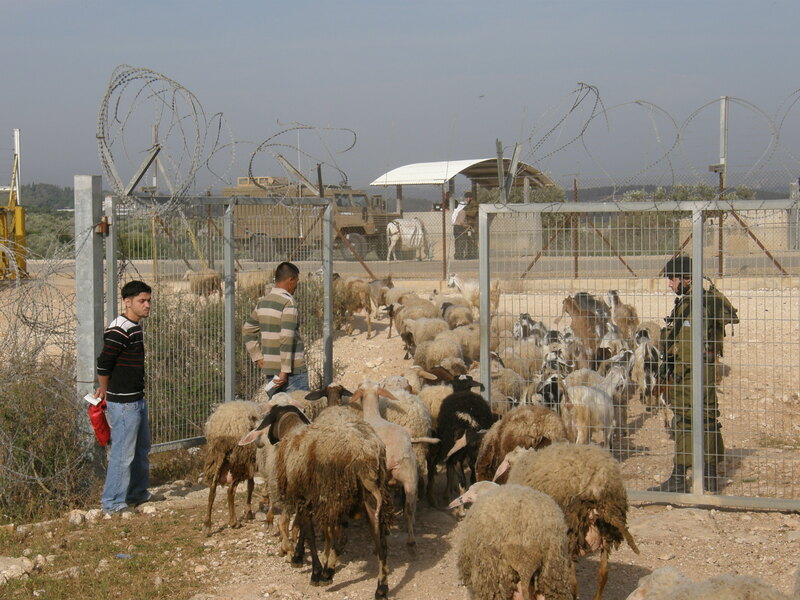 EAs accompany Abu Azzan to visit his released land. Photo EAPPI/S. Skanberg. Throughout my 3-months Palestine and Israel with EAPPI, I have felt quite at home as our team has been welcomed by the Palestinian people with much hospitality. When I return home, I will have much to share about what life is like for these new friends as they live under occupation. Despite all the difficulties, I also see much hope and faith. One example of this hope and faith is the dedication of farmers who have been separated from their land by the “separation barrier” for the last dozen years. The last few weeks, however, have been sacred for the people of Jayyus as they saw 1/3 of their land released from the behind the barrier in early September. An Israeli high court decision promised to release this land several years ago, however, Israeli authorities only implemented the decision this September. Since that time, Palestinians who own parts of the land have started a pilgrimage to their land. Now, everyone can go whenever they want, without the need for an agricultural permit. EAs join a Jayyus farm for tea in his released land. Photo EAPPI/S. Skanberg. “This is the first time on my land in a dozen years with my children.” Photo EAPPI/K. Rodman. In this area, the separation barrier was removed and Palestinians can once again access their property. Many people were able to return to their land for the first time since 2002. For farmers, having access to their land means they no longer need to line up at the agriculture gate during restricted hours to have their permit and finger prints checked just to get to their own land. It means they don’t have to constantly keep looking at their watch in order to get back home through the gate at the specified time. It also means that I, as an international, could go to the land, something not possible before. There were many surprises when families visited their land for the first time since 2002. In fact, they noticed that the land is much more productive and much more of it is cultivated than before the barrier was built. Villagers told me that there is about twice as much land cultivated than was when the separation barrier was put in place. It seems that people decided the best way to protest the loss of their land was to put their energies into cultivating and reclaiming it. This cultivation was important as Israeli laws inherit an old Ottoman law stating that land can be claimed by the Israeli state if left uncultivated for 3 years. The Israeli government uses this law to confiscate land left uncultivated by Palestinians, even land that is difficult to access on the other side of the separation barrier. For this reason, farmers from Jayyus focused on their agricultural practices, during the past 12 years. They worked painstakingly to efficiently use their limited water to irrigate the citrus and other fruit trees, along with the greenhouses filled with vegetables such as tomatoes and cucumbers. The village is fortunate in that it has 6 water wells, but still struggles to have the necessary water resources as Israeli authorities control their wells. Also, the community had to rely on diesel fuel to pump the water rather than electricity, as Israeli authorities also forbade them to run electric lines to the wells. Pumping water with diesel proved to be much more costly than electricity. Some villagers estimate they had to pay double the cost. Despite all the obstacles they faced, the people of Jayyus pulled together, working to reclaim some land that had not been cultivated previously, and to create their own garden of Eden so to speak. The first time our team visited the land was a few weeks before it was released. At that time, it was a 2 hour journey. We took an Israeli license plate taxi to one checkpoint, only to find it closed. We traveled to another checkpoint where we spent an hour, while the taxi vehicle was searched. Now, we can simply walk across what was the military road and we are there! Falamiya gate before the rerouting of the wall. Farmers had to wait here every morning and evening to access their land. They could only cross this gate to their land if they had the necessary permission. Photo EAPPI/J. Byrne. Falamiya agricultural gate now. Photo EAPPI/M. Stockbrugger. Families have returned from around the West Bank and even Jordan to go to the land. Even those families who do not have land or still have land behind the new separation barrier came to spend time on the land of friends. They gather beneath fruit groves, roasting chicken and vegetables over open fires. Children play where their parents and their grandparents had once played. However, it really isn’t a celebration. It is perhaps rather a symbol of what freedom and peace could look like, but the challenges of occupation are still in the foreground. Even as the separation barrier has been removed to “free” the land, a new separation barrier is in place marking that two-thirds of the land is still not accessible except through military gates. The shiny new barb wire glistens in the sun. In the area adjacent to the barrier, the barb wire even encloses olive trees making them inaccessible—a symbol of the Israeli military occupation—not even the olive tree can be free. A new gate is in place, but it is only open three times a day for a half hour. Previously one of the gates was open for 12 hours a day. Some farmers have land both inside and outside the separation barrier, meaning it is almost impossible to manage their work in both places to irrigate fruit trees and greenhouses, while needing to move back and forth except in the narrow window of time afforded by the Israeli military. For some farmers, their land is very close to the village but with the new route of the wall, they must travel about 10-15 or more kilometers each way to get to the new gate and then circle back alongside settlements to their land which is literally a few feet from where they started. The village is also relieved to have 1 of its 6 water wells on the released land. They have built infrastructure needed to bring water from the well to town and make the village green and productive, but approval from the Israeli authorities is still required for the electric line to be run to the pumping station. The mayor of Jayyus informed us that while the land was on the Israeli side of the wall they were able to sell produce in the Israeli market. Now for land that is on the Palestinian side, farmers are free to cultivate it, but their usual market is no longer accessible. Although the village is happy to have some of their land, it cannot be seen as a complete victory. Still many families have some or all of their land on the Israeli side of the wall. Many tears have been shed over the years lost in cultivating and enjoying their land. The separation barrier is still visible, despite its new route and is a reminder that every aspect of life in the West Bank is under military rule. I am amazed by the steadfastness of the villagers of Jayyus. They have faced a huge catastrophe. Their land has been behind a separation barrier, but still they have found a way to make their land flourish. For this harvest people can share delight in returning to the land with their families to spend it together in the fields they love and remember. They find that the occupier has not destroyed those fields, but rather the farmers have put their heart and souls, their sweat and steadfastness into a land for the future—a land that can be released when it is no longer under occupation. The pilgrims making their way to the land for the first time in a dozen years perhaps find a glimpse of “new heaven and a new earth” as they remember their past when they were free from occupation and hope for the future when they again can be free from the occupation. Children: what’s the toll of occupation? Although children do not choose to participate in conflicts, from an early age they are often caught in the crossfires of hostility, violence, or war. Their loss of innocence and a carefree childhood is an especially tragic part of conflict. 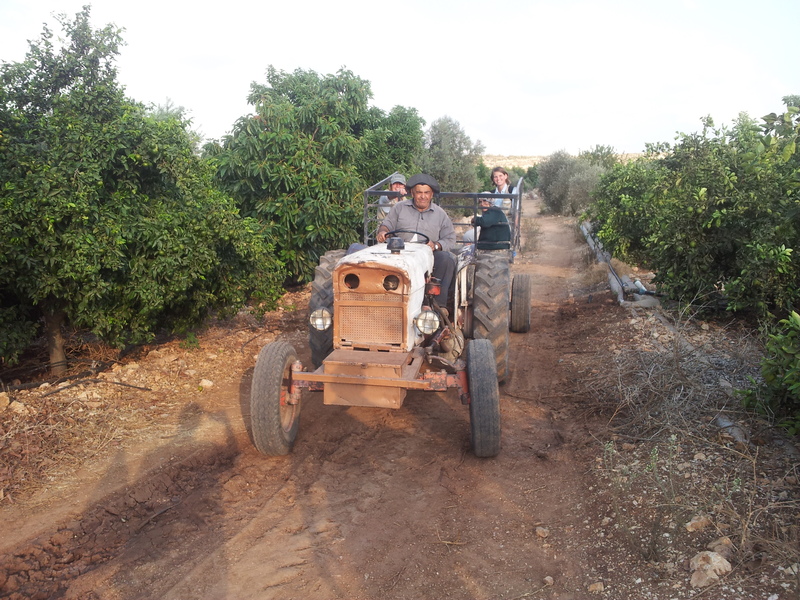 Last Sunday, I was traveling to Nablus with another member of the Jayyus EAPPI team. 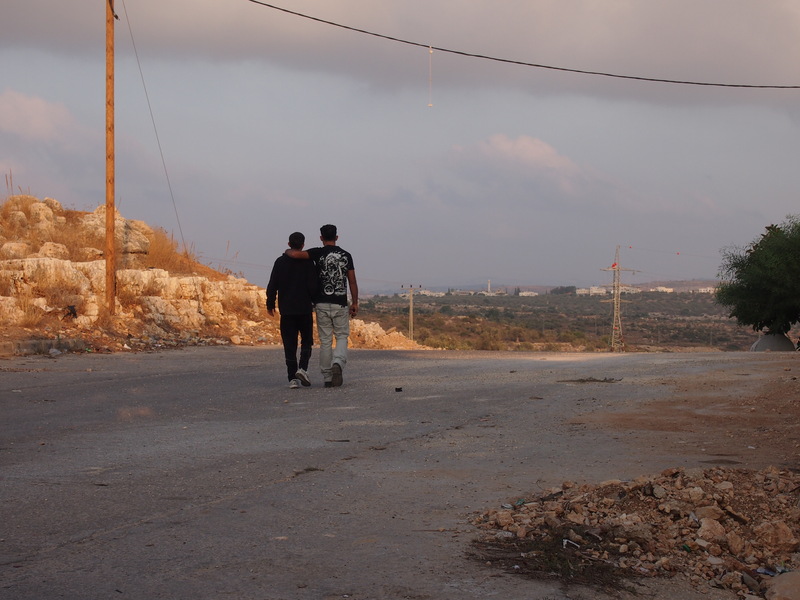 As we approached the road where we expected to catch a taxi, we noticed the Israeli army detaining two young Palestinian boys across the road from us. The boys leaned against the guardrail with their backpacks at their feet as a soldier kept guard over them. The difference in size between them and the soldier was a striking illustration of the imbalance of power between the boys and the soldiers. 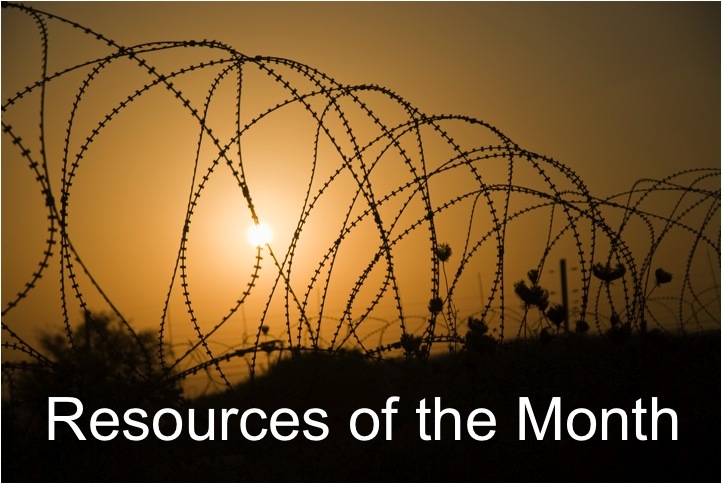 When one of the fathers asked questions of the soldier, he answered very few questions. Eventually, the soldiers led the boys to the back of an army jeep and drove off with them. When the rest of the families arrived shortly afterwards, they wondered where their children were being taken and what would happen to them. Palestinians who witnessed the scene told us that the boys were picking leftover olives – as many boys do at this time of year for some extra pocket change – in an olive grove that runs alongside the road when they were detained. 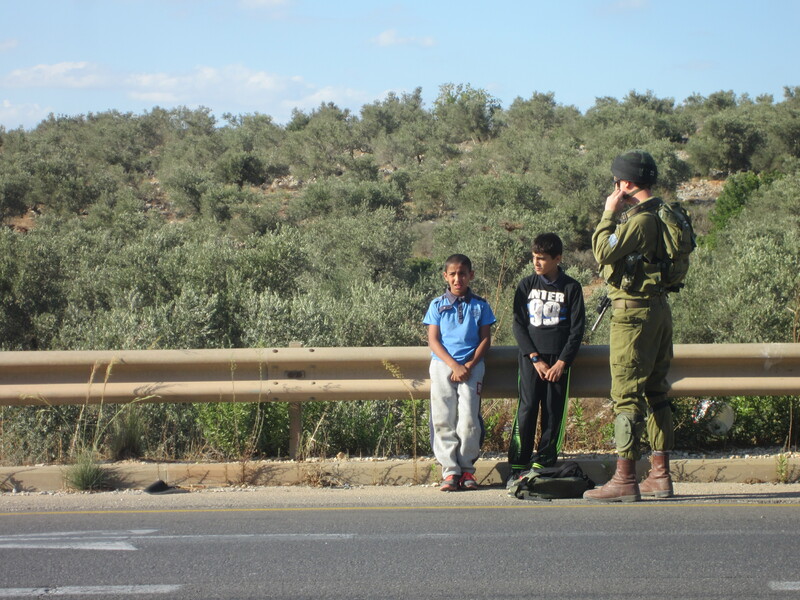 The Israeli army claimed that the boys were detained because they were in fact throwing stones at Israelis on the road. That evening, I couldn’t forget what I had seen that afternoon. I don’t know whether they had thrown stones or not, but the reality was that these boys were now in the hands of people whose treatment of Palestinian youth is often dubious. I wondered helplessly what they were going through at that moment and how scared they were. A few days later, another member of the Jayyus team and I visited the two boys who were detained. Thankfully, they were released the same night. As we sat in their living rooms and drank coffee with their families, they recounted their experiences to us. They told us about how they were handcuffed and brought to a police station in a settlement. About how they were left to sit out in the cold for two hours. About how they witnessed an Israeli soldier beat another boy being beaten. About how the soldiers knew they did not throw the stones, but kept them for eight hours anyway. The events of the detention traumatized one of the boys especially. We could tell he was still frightened and in shock. For that reason, his mother did not sent him to school that week. As I sat there, I could not think of any appropriate questions to ask him or his family. What I really wanted to know could not be answered in that moment. What I wanted to know about this boy and about the Palestinian youth was the toll of occupation. Do these kinds of traumatic events leave imprints that lasts a lifetime? Does living in constant fear of unjustified arrests, detainments, and having the army knock down your door in the middle of the night ever become normal? How can children and their families possibly cope with this fear? Maybe I cannot answer these questions fully, but they in themselves point to the effects of the Israeli occupation; it is ruthless and relentless and children are suffering because of it. Of that, I’m convinced.